14-Jan-2005 -- At midnight we had completed the loading operations of citrus fruits in the port of Mersin, and one hour later we put to the Sea with destination Vlissingen in The Netherlands. The first confluence to visit in the morning whilst sailing exactly on the 36th parallel along the Turkish coast towards West was 36N 33E. The visibility was not very good, but as the point is not too far offshore, we could make a few shots. Let's first look towards West. 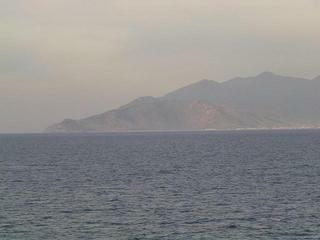 There we see Cape Anamur (Anamur Burnu) with its prominent lighthouse. Looking to about Northwest we see the town of Anamur and its small harbour of İskele. To the North there is the town of Bozyazı. The small harbour of Bozyazı is intended to be used as a ferry port for a service to Kyrenia (Kerýneia/Girne) in Northern Cyprus. Looking to Northeast, we see Cape Kızılliman ("Red Port") and the impressing ranges of the Anatolian mountains, some of them already partly snow-capped. The name "Cape Anamur" may sound familiar to many readers. There is a ship named so and famous in many parts of the world. She is basically a normal cargo freighter, but chartered by a worldwide operating relief organization, whose task is to rescue refugees at sea. The first "Cape Anamur" came into service in the late seventies. After Vietnam was united under communist North Vietnamese rule, many ten thousands of South Vietnamese tried to escape, mainly over the sea to Thailand and Indonesia. These refugees, who became famous under the term "boat people", neither were experienced in navigation nor did they have proper boats. They used everything being able to float, even the simplest rafts, and these vehicles were generally overcrowded by several large families. So they put to the Sea, even during the most dangerous seasons in this typhoon-stricken area, and nobody will ever know how many of them died. At the beginning many boat people were picked up by passing freighters, mostly en route between Singapore and Japan/Korea. But soon the flow of immigrants became too high, and such ships faced increasing problems to disembark the refugees in their ports of arrival. The wealthy Northeast Asian countries were no longer prepared to accept them. Soon freighters, although strictly obliged to assist according the SOLAS (Safety of Life at Sea) convention - became reluctant to pick up "boat people". Captains, well aware of the forthcoming problems, simply passed and closed their eyes when seeing such boats and rafts full of refugees. Many shipping companies did even order their Captains (of course never in the written form!) to under no circumstances pick up any "boat people", simply due to the problems with immigration authorities and expensive delays in the ports of call. So the captains of ships in this trading area were in a permanent moral dilemma. Passing by and not picking up them would mean certain death to these people, but picking them up on the other hand would mean to act against the secret ship-owner's orders, risking their own dismissal. Many ship-owners clearly told their masters: "If you pick up boat people and we face problems and delays in the next port, we will sack you!" Some captains continued to pick them up, but I guess most of them did no longer. Soon this fact became known to worldwide relief organizations, and so the "Cape Anamur" came into being. She circled around in the South China Sea and rescued many thousands of these poor Vietnamese "boat people" during the forthcoming years. Today there are no longer Vietnamese boat people, but this does not mean a "Cape Anamur" no longer to be needed. Unfortunately, the "Cape Anamur" is still badly needed nowadays. And I daresay: more than ever. The extremely wide and deep gap between the billions of men in countries without job and food and those in the comparatively few and lucky countries where labour and money is still available, has caused a flow of migration from the poor to the wealthy countries of an extent never seen in history before. Central Asians and Africans prefer Western Europe, the Latin American emigrants traditionally love the US. Since many years, the wealthy countries can no longer cope with this problem. The battle against illegal immigration is already lost - despite what they may tell us and despite the more stringent visa regulations and improved border controls (European politicians love it to talk proudly of their achievements regarding the "Fortress Europe" with its highly sophisticated border control systems. It's all crap, the illegal immigrants become more and more with every day). Every day thousands of refugees arrive via the Mediterranean Sea and the endlessly long Eastern European border from Finland down to the Black Sea. And there are many who are trying to stow away with cargo ships. Whilst the ship is in port, they come on board, mostly dressed as port workers and hide somewhere on the ship until well after her departure. They are of course aware of the destination the ship is bound for. So we have never to deal with stowaways when bound for Africa, but prior departure from a port in a comparatively poor country with destination Europe or North America, we have to search our ship meticulously again and again. Not seldom we find some, and as long as we do that in port, it is no problem. We just kick them off our ship. But once at sea, we have to bring them to our destination, and that causes endless problems and headaches with the immigration authorities. Nobody wants them, and the fact that they are usually without any documents makes the problem worse. No embassy or Consulate General will feel itself responsible for a person not being able to prove his nationality. So stowaways cannot disembark in any country and in extreme cases they are forced to remain on board the ship they stowed away with for even years! I personally recall in the late eighties I had two stowaways. They had come on board in Dar es Salaam (Tanzania) and our ship was bound to Portugal. Portuguese Immigration did not allow them ashore, and so no other authority in any of the forthcoming ports did. After eleven months I disembarked myself for vacation, and the stowaways were still on board. Then, a four years later, I happened to take command of this ship again, and picture: my poor two Dar es Salaam guys were still on board! Recently I learned from the usual worldwide coastal gossip that this ship had been brought to Taiwan in 1998 for scrapping. And picture: My stowaways were still on board! As they hardly could scrap the boys as well in the Taiwanese scrap yard, I guess they finally could disembark there and I wish them all the best for their future. They were okay guys, no problem, they worked hard, but in every port I had to fill up a lot of papers and to guarantee they will not step ashore. In many ports they were even carried away to jail by police and brought back on board five minutes prior departure. So these two boys have been on board this ship for more than ten years without a single step ashore in any country (jail visits excluded)! Of course, a salary was not paid to them, either - and what should they have done with money, if no chance to spend it anywhere? They just worked for their daily meals. And here we are back with Turkey. Of course, you cannot and must not compare Turkey with Nigeria or Sierra Leone. In worldwide statistics it is even a wealthy nation, but compared with the relatively close Western Europe it is still a poor country, and England, Holland, and Germany is the paradise for many Turkish nationals. Since European Union became extremely reluctant in granting visa to Turkish citizens, they search for other ways to immigrate illegally, and so we are concerned as well with our ship. Well, we have searched the ship prior departure as well as we could, and now we are already almost one full day at sea and no stowaway has shown up so far. 24 hours is usually the time elapsed until they come out from their hideaways - driven by hunger.